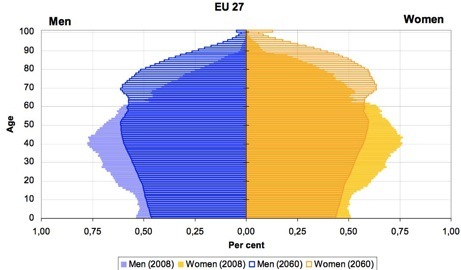 The European Union faces significant population ageing. Ongoing demographic changes due to low fertility rates, the continuous increase in life expectancy and the approaching retirement age of the baby-boom cohorts are expected to dramatically affect the European population size and age-structure. As is frequently recalled, ageing populations will raise significant budgetary, economic and social issues. The phenomenon increases pressure on pension systems, public finances, social and care services for older people, heightening the risks of exclusion from the labour market, family and community life, and intergenerational conflicts. However, it is equally true that ageing can bring potential opportunities. The elderly may significantly contribute to tackling the challenges of population ageing by remaining active and autonomous after retirement and by delaying their exit from the labour market. The historic increase in educational levels and substantial improvements in health conditions make elderly people a great potential for social and economic development. Thus, active ageing emerges as a key factor in the process of optimising opportunities for health, participation and security and as a way to enhance the quality of life as people age. The European Union plays an essential role in supporting policies and actions in the field of active ageing implemented at Member State, regional and local level. It also recently intensified its efforts to promote the exchange of knowledge and experiences. In 2009 the Council of the European Union adopted Conclusions on Equal opportunities for women and men: active and dignified ageing. These conclusions underline, amongst other things, that “the persistence of gender stereotypes which, compounded by discrimination faced by older people in the labour market, particularly reduce the employment opportunities of older women; women’s greater vulnerability in the labour market, due also to the impact of career breaks or taking time out of employment to engage in caring responsibilities on women’s pension entitlements, which, together with the persisting gender pay gap, exposes women to a higher risk of poverty in old age as compared with men”. The Council of the European Union also adopted in 2009 Conclusions on Healthy and Dignified Life, arguing that healthy and dignified ageing must involve a gender dimension, taking into account the specific needs of both women and men. The European Commission adopted a Communication on Ageing and an accompanying report in April 2009, and in September 2010 it proposed to make 2012 the “European Year for Active Ageing” in order to raise awareness, to boost the dissemination of good practices and to encourage policy-makers and stakeholders to commit to specific actions and goals. From the gender equality and social inclusion perspective, this report provides a concise overview of the employment and activity of women and men in the 55-64 age group (i.e. the last 10-year cohort of the working age population) and of the activity of women and men in the 65- 74 age group in the EU Member States, the EEA/EFTA countries (Iceland, Liechtenstein, Norway) and three candidate countries (Croatia, FYROM and Turkey). The programmes available on active ageing and the main policy areas addressed in these countries (such as adjusting age management in work places and labour markets, opening job-opportunities, retaining and reinserting persons in employment, offering access to appropriate training and life- long learning possibilities, promoting volunteer and community work opportunities after retirement, and enabling easier access to active and healthy ageing support services including care for dependent relatives) are examined in order to identify effective strategies for active and healthy ageing.